The Ranty Highwayman is a chartered engineer who works in a local highways department. In this article he discusses unsung heroes. Being a Londoner and a transport geek, I follow Transport for London’s traffic Twitter feed and it recently made me think. There was a tweet about one of the Blackwall tunnels being closed for overnight maintenance and I was left wondering if the thousands of people driving through it each day ever registered what it must take to keep this part of the city moving? Of course, if the engineering overruns we soon get the bleating from people who simply haven’t thought through the complexities of organising, staffing and running jobs like this, plus the fact so much of the work relies on muscle-power to get things done and often within a short window. 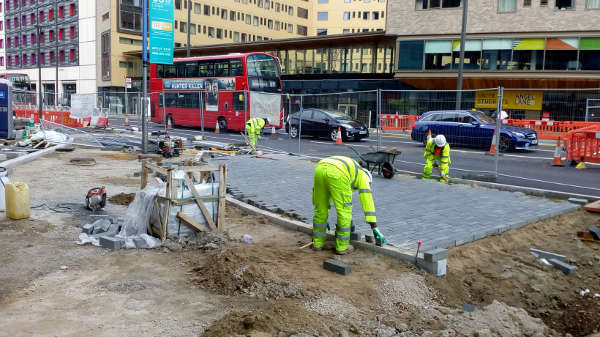 I’m talking about the road workers who wrestle the kerbs into the right place, the setting out engineer who makes sure everything fits together on site and the fitter who comes to repair the excavator when a hydraulic line blows. We’ve people out in the blazing sunshine in six-point PPE trying to dig holes, lining crews chasing the early hours to get road markings complete before the morning rush hour and landscape contractors trying to get things looking just so before the photographers turn up to profile the scheme. Away from site do we ever give a thought to the graduates working for the consultants? These are the people who spend hours cranking the handle on the transport assessments so the associate can sit straight-faced in a planning meeting saying the scheme won’t cause any traffic problems so the client can then get their planning consent – OK, I’m half joking. We have the CAD technicians who translate the aspiration into a coherent drawing that can be used on site. What about the parking beat surveyors out in all weathers and all hours looking to collect the data for a parking stress report or the people sitting in deckchairs next to a busy junction getting the turning count data for the ultimate traffic model? I don’t think we recognise the hard work our people put into maintaining and improving the network, let alone raising their profile with the public at large. Sure, we’ll have an awards ceremony celebrating the latest scheme where the boss of the consultant or the leader of the council where it was built get to have their photos taken, but where are the people who made it happen? I know we must ultimately have someone in charge to make sure the vision is implemented, but wouldn’t it be nice for the chargehand to accept the award, the clerk of the works to be in the photo with the CEO or the apprentice getting the 15 minutes of fame? The routine parts of our business are not particularly glamorous, but we should definitely be raising their profile. Personally, I find the work of a lining crew mesmerising – surely you’ve all seen the video of the bus stop being marked out? What about the precision of a good backhoe excavator operator, or the meticulous attention to detail in a brickwork chamber where the only people to see it will be the bricklayer themselves and the cabling technician? Our industry runs on unsung heroes and, without them, the transport and infrastructure strands holding our modern civilisation would unravel. Much of this work is only recognised by the public when something goes wrong, be it a sewer collapse, the lane closures still in place because of the breakdown at the asphalt plant or the signals still out after being clouted by a lorry. In fact, for the vast majority of the time, stuff just gets done without a problem and the effort just melts away into the background. So, I hope you can join me in recognising and celebrating the work of so many people in our industry, which continues without fanfare or accolade, but whom without, we wouldn’t have an industry at all.